Sri Amaruviappan Temple in Therazhundur (Near Mayiladuthurai) is one of the ancient Vaishnavite temples in India. Sri Thirumangai Azhwar has sung 40 hyms on Lord Amaruviappan. Kambar, who wrote Kamba Ramayanam was born in this place. It is said that Sri Amaruviappan and Sri Sengamalavalli Thayar are the source of inspiration for Kambar to write the great epic in Tamil. Now the temple is undergoing a renovation, after many years. Dr U. Ve. 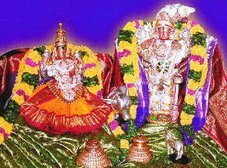 Ananthapadmanabhacharianar in his programme 'Dinam oru Divyanamam' in Jaya TV on 27th July 2009 made reference about this ancient temple and the greatness of Shri Amaruviappan. The streaming of this video will be smooth in broadband connections. In case, you find any difficulty in streaming, you may right click this link and save the target/lin to your desktop in wmv format (12 mb). You can play through windows media player. This is site is maintained by Sri Goska Bhakta Sabha, devotees of Sri Sengmala Thayar sametha Sri Amaruviappa Perumal, the prsiding Deity of Terizhandur (10 km from Mayiladuthurai). Terizhandur is also the birth place of Kavi Chakravarthy Kamban.